When my son was a toddler, I remember a few events that I declined to attend simply because it was too complicated -- I just didn't have it in me. Looking back at the earlier years, I realize just how little people new about my son and his autism. I think our experience would have been different had others been more aware. 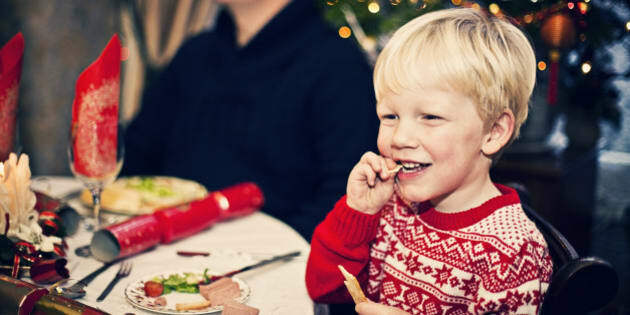 Happy smiling little boy enjoying his Christmas dinner with family. The holidays are fast approaching and that magical feeling of Christmas is in the air. For many families this a joyous time, anticipated with much excitement. But for other families living with autism, the holiday season creates fear and anxiety. We know all too well that Christmas represents the motherload of sensory overstimulation, a disruption in our child's sacred routine and the unpredictability of visiting family and friends that may or may not fully understand autism, let alone our child. When my son was a toddler, I remember a few events that I declined to attend simply because it was too complicated and too exhausting to even leave the house. In order for my son to have a somewhat normal evening at someone else's home, I would have to pack everything but the kitchen sink. I just didn't have it in me. Looking back at the earlier years, I realize just how little people new about my son and his autism. I think our experience would have been different had others been more aware. If you're hosting a party this holiday season and have a family member or friend with a child with autism, then consider these 10 tips that can help them experience a pleasant and positive event. Many people with autism have severe sensory issues, which leads to an aversion to many different kinds of food due to the smell and texture. Extending the invitation that they are more than welcomed to bring their own food and cook it on the spot, alleviates a tremendous amount of pressure on the parents. Most often, the child will not eat anything that you will be making. For the parents, it's heart-wrenching to be at a party watching everyone enjoy their meal except for their child because there isn't anything available that they like to eat. Having the parents bring their own food will ensure their child will enjoy a nice meal like everybody else. If your budget allows it and you really want to go that extra mile, ask them what foods they like and then make them. If the child loves chicken nuggets for instance, let them know you'll make some specially for them. Buy their favourite drink or their favourite brand of cookie. Give them something they are familiar with and they will be so happy. Mom and dad will be happy, too, because that means they have fewer items to bring. This isn't always easy but sometimes a little thing like greeting the child with a kiss can trigger a major meltdown. Going through this is important and understanding the triggers beforehand is a bonus for everyone, especially for the child. For many parents with autistic children, the first thing we do when arriving in someone else's home is quickly scanning the entire area for any visible items that we know can trigger a meltdown. Being prepared ahead of time eases this tension for the parents. Do they have a favorite blank or a specific routine they enjoy to calm themselves down? Perhaps they enjoy taking a bath or watching a video quietly. Offering them whatever support you can is awesome and it will be deeply appreciated. We all need to escape the craziness of a party, even more so for children with autism. Have a designated area away from all of the noise and confusion where they can retreat and calm down. Let them know this is their safe zone and they can go there anytime they want. Make sure you tell everybody else at the party that this room will be off limits and to respect his/her privacy. Most parents don't get to eat their dinner together when out at parties like this. Watching their child is the number one priority. Sipping a glass of wine with their meal is more accurately chugging everything down in three minutes flat or walking around with their dinner plate just so they can keep an eye on their child. Designate a few family members to take turns watching their child so mom and dad can enjoy their dinner with everyone else. Even a 30-minute uninterrupted meal is heaven! Try to involve the child whenever you can. For example, if you are going to open presents but the lights and noise are too much for them, then try turning down the lights and keeping everything very quiet. Better still, follow their cues. Perhaps they want to unwrap their present alone in the corner. Let them do it their way but pay attention to them because this moment is huge, and in doing so you're letting mom and dad know that their child is included in the celebration, that they are seen and heard. Don't force the child to do anything they do not want to do. If they refuse to do something such as greeting someone with hello, giving someone a hug or a handshake, it isn't because they are being rude, it's because their sensory issues make it too much for them. No means no, so don't insist. Respecting their limits is very important. Mom and dad have waited a long time to see their child reach many milestones. They are happy and proud of every one. Asking about their child's accomplishments is validating all the hard work that they and their child have done. Extend the invitation that they are welcome to come back anytime. For many parents of children with autism, they don't get to go out as much as they like. Having friends and family that understand autism gives them a sense of comfort and a new place that they can take their child where he/she is respected, safe and loved. Make this holiday season a memorable one for a family with autism. With just a few small adjustments, you have the power to help create some wonderful memories.